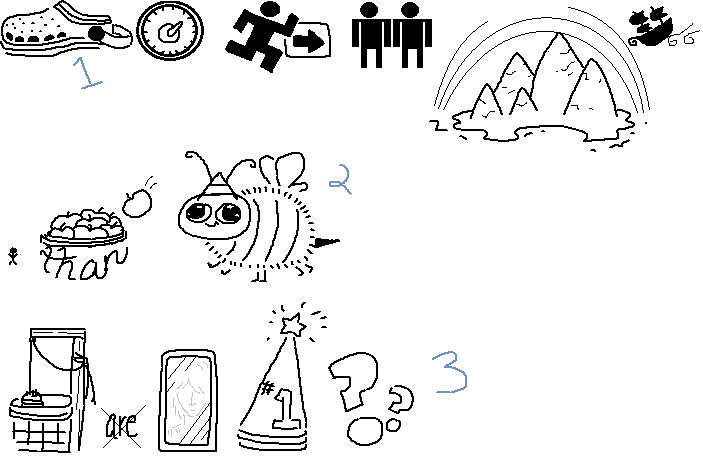 Today I've decided to make puzzles using images because that's easier for me to do than think of a sub-par riddle. A note about these: no, they do not necessarily pertain to a famous saying. Rather, they are simple sentences or phrases about something. There isn't anything hidden in the image hex or bit-wise; what you see is what you need. I hope these ones are pretty easy! I plan to make more complicated ones down the line. The fruit in the basket aren't the focus of that picture; what's happening to the number of items? Is that something on the bee's head? That man's proportions are off! The cross-out only pertains to the word it is on. There's nothing clever about it! The hat should only be worn by the ace. What do you see staring back at you? The third image in 3 is not an iphone; what's important about it is what you see looking into it. The first image is something most people don't have in their yards anymore. "Little more than a bee sting"
"Well aren't you a winner?" Crocodile leaves to neverland ? Not the answer you're looking for? Browse other questions tagged visual rebus english or ask your own question.